Eric Rohmann won the Caldecott Medal for My Friend Rabbit, and a Caldecott Honor for Time Flies. He is also the author and illustrator of Clara and Asha, A Kitten Tale, and The Cinder-Eyed Cats, among other books for children. He has illustrated many other books, including Last Song, based on a poem by James Guthrie, and has created book jackets for a number of novels, including His Dark Materials, by Philip Pullman. Rohmann was born in Riverside, Illinois in 1957. He grew up in Downers Grove, a suburb of Chicago. As a boy, he played Little League baseball, read comic books, and collected rocks and minerals, insects, leaves, and animal skulls. Rohmann has his BS in Art and an MS in Studio Art from Illinois State University, and an MFA in Printmaking/Fine Bookmaking from Arizona State University. He also studied Anthropology and Biology. He taught printmaking, painting, and fine bookmaking at Belvoir Terrace in Massachusettes and introductory drawing, fine bookmaking, and printmaking at St. Olaf College in Minnesota. He lives in a suburb of Chicago. Kirkus Reviews Best known for fluid, superbly realistic oil paintings, Rohmann switches to thick-lined colored woodcuts and a simpler pictorial style for this nearly wordless, engaging, wacky episode. . . . Rohmann uses wordless, and sometimes even empty, frames to great comic effect, allowing huge animals to make sudden entrances from the side—or from above, and artfully capturing the expressions on their faces. Young readers and pre-readers will chortle at the silliness of it all while enjoying the sometimes-demanding friendship between these disparately sized chums. 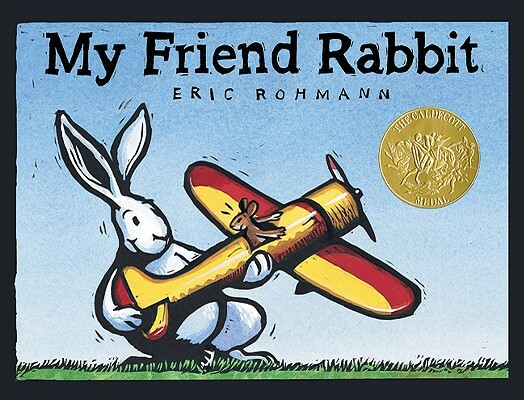 Booklist Mouse, the narrator who flies a red and yellow biplane, tells listeners that his friend Rabbit "means well," but that trouble always follows him. Then comes a smart, sassy object lesson on how much trouble Rabbit brings. The fun of this is in the spacing and sequencing of the heavily ink-outlined drawings. After Rabbit has thrown Mouse's beloved biplane into a tree, one full page consists of tiny Mouse staring up, ink accents marking his exasperation. On the facing page, Rabbit darts off, promising a solution. The next double-spread shows an anxious Mouse as Rabbit drags one enormous tail into view. The space fills with a massive elephant. Then Rabbit pulls in, among others, a rhino, a reindeer, and a duck (followed, of course, by ducklings). Now, the two-page spread must be turned vertically to reveal a giant pyramid of animals, topped by a squirrel holding Mouse, who reaches for the biplane--then the mass topples. Rage-filled beasts turn on Rabbit. Mouse, flying in on his recovered plane, saves Rabbit from their clutches and claws. Tremendous physical humor delivers a gentle lesson about accepting friends as they are. School Library Journal A simple story about Rabbit and Mouse, who, despite Rabbit's penchant for trouble, are friends. When Rabbit launches his toy airplane (with Mouse in the pilot seat at takeoff) and it gets stuck in a tree, he convinces his friend that he will come up with a plan to get it down. He does so by stacking animals on top of one another (beginning with an elephant and a rhinoceros) until they are within reach of the toy. The double-page, hand-colored relief prints with heavy black outlines are magnificent, and children will enjoy the comically expressive pictures of the animals before and after their attempt to extract the plane. The text is minimal; it's the illustrations that are the draw here. Publishers Weekly My friend Rabbit means well, begins the mouse narrator. But whatever he does, wherever he goes, trouble follows. Once Rabbit pitches Mouse's airplane into a tree, Rohmann tells most of the story through bold, expressive relief prints, a dramatic departure for the illustrator of The Cinder-Eyed Cats and other more painterly works. Rabbit might be a little too impulsive, but he has big ideas and plenty of energy. Rohmann pictures the pint-size, long-eared fellow recruiting an elephant, a rhinoceros and other large animals, and coaching them to stand one on top of another, like living building blocks, in order to retrieve Mouse's plane. Readers must tilt the book vertically to view the climactic spread: a tall, narrow portrait of a stack of very annoyed animals sitting on each other's backs as Rabbit holds Squirrel up toward the stuck airplane. The next spread anticipates trouble, as four duckling onlookers scurry frantically; the following scene shows the living ladder upended, with lots of flying feathers and scrabbling limbs. Somehow, in the tumult, the airplane comes free, and Mouse, aloft again, forgives his friend... even as the closing spread implies more trouble to follow. This gentle lesson in patience and loyalty, balanced on the back of a hilarious set of illustrations, will leave young readers clamoring for repeat readings.